I’ve been living with my DVDs of the recent TV series of Sherlock (Gatiss and Moffat) for almost two weeks now and it’s got to the stage where I just have to write a blog post in order to clear my mind. As things stand at present, I cannot focus on anything except this new obsession of mine and I haven’t had a decent night’s sleep since watching the first episode (too excited to sleep!). Once this blog post is done, perhaps I’ll be able to get down to rewriting my chapter on the repetition in Muriel Spark’s use of prolepsis which has to be submitted in about six weeks’ time…I hope so, anyway. Otherwise I’ll end up frantically searching for a way to haul my conkers out of the fire. Again. So, let’s begin by stating the obvious: in creating a series based on Sherlock Holmes, Gatiss and Moffat were dealing with a character already familiar to many: the super-sleuth of Baker Street, a violin-playing, drug-abusing loner, isolated by his intellect, but (marginally) humanised through his contact with Dr John Watson. Watson is the I-narrator and focaliser of the original Conan Doyle stories: he is the medium through which we observe events unfolding, and we watch Holmes solve the crimes through Watson’s eyes. Watson’s narratives are, of course, translated into a blog for the twenty-first century and the contemporary setting has necessitated other changes: Holmes and Watson refer to each other by their first names – there’s no ‘Elementary, my dear Watson’ (although I’m not entirely sure Conan Doyle’s Holmes ever said that anyway – I’m afraid I’m in a position of relative ignorance as far as the original stories are concerned), and obviously the technology is different – twenty-first century Sherlock uses a smartphone to access the information he needs. 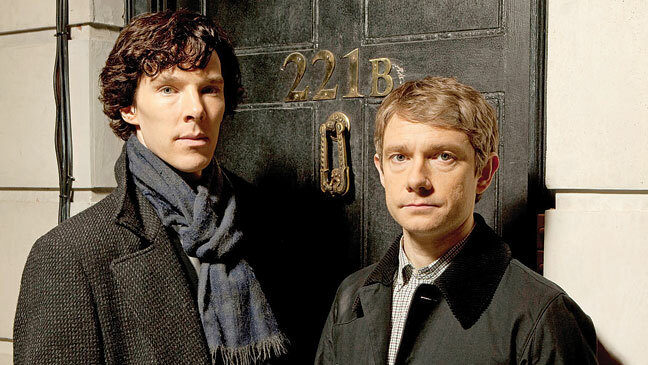 Sherlock’s brilliance is explained in twenty-first century terms – he describes himself as a high-functioning sociopath with a hard drive for a mind and John Watson makes reference to Asperger’s Syndrome in the Hound of the Baskervilles episode. 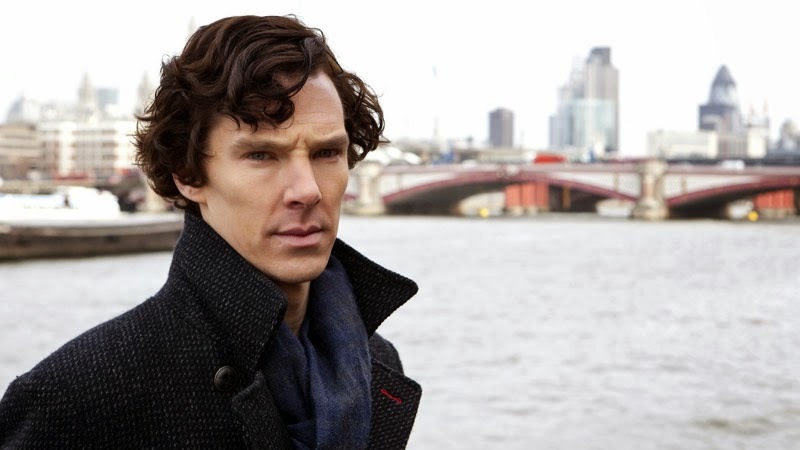 But what is interesting is the extent to which the new Sherlock is still Conan Doyle’s Holmes: the way he talks, the way he dresses, the appearance of his flat at 221B Baker Street, and the fact that he almost always travels by taxicab. I was pleased that the villain in the first episode was a taxi driver, because taxis are important in this series (hence my title). So, the coat and scarf, the habit of talking in paragraphs or at least perfectly-formed sentences, the dated decor of the flat and the ubiquitous taxis, together create a distinctly nineteenth-century atmosphere. He is Sherlock Holmes still. 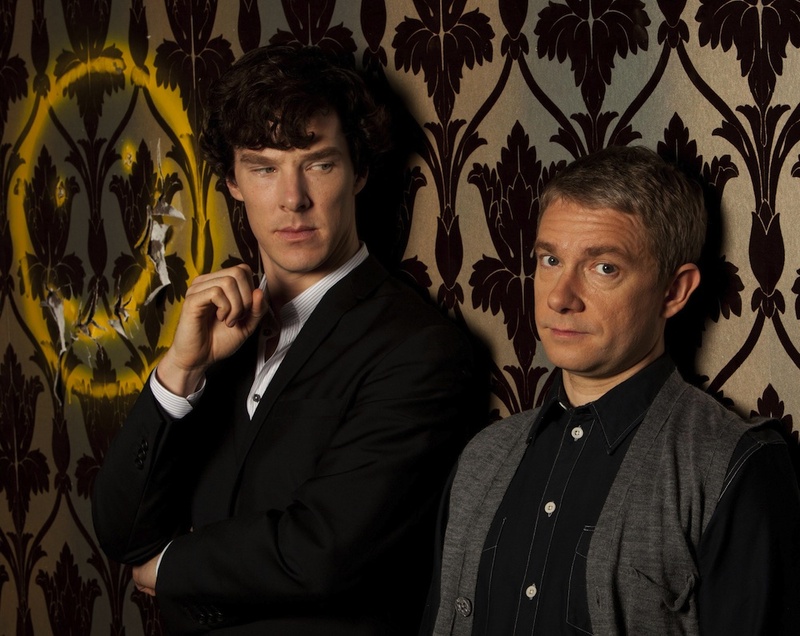 As far as the TV series is concerned, John Watson is not our only narrator. 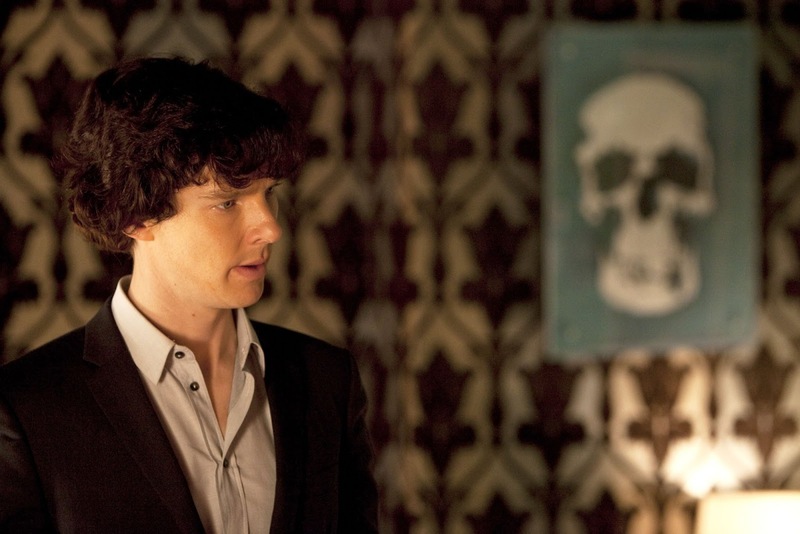 The camera closely directs and controls our view of proceedings, and in addition to this, many scenes are complemented by the appearance of words or symbols actually in the frame, appearing next to or on the characters: we see the wording of texts and other written messages, or signs either linguistic or pictorial that reveal a little to us of Sherlock’s thought processes. All this is easy for a twenty-first century audience to assimilate, of course: thanks to the internet, we are used to reading words and images together and I’m guessing most viewers would take the appearance of words onscreen on board without batting an eyelid, especially those well-versed in comic books. It’s only a form of caption, after all. The fact that we can see, for example, the words ‘Number blocked’ in the frame when Sherlock receives a phone call negates the necessity for a verbal explanation or a close-up of the mobile phone in question. 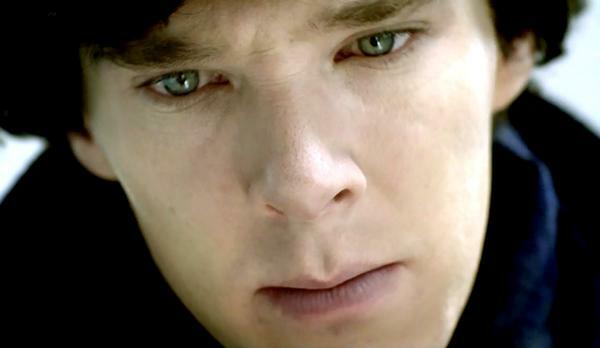 The close-ups we do get are, for the most part, of the almost impossibly beautiful Benedict Cumberbatch as Sherlock, which is ironic, because of course we are not close to this character and never will be. We watch him work as he unravels the latest mystery: he looks directly at us so that we take the place of the object he is gazing at, but in spite of this physical proximity, we are kept at a distance by Sherlock’s personality: by his genius and by his inability to relate to other human beings, his failure to understand, for example, why a woman should still mourn her still-born daughter of fourteen years ago. He is apart from us. In fact, as far as he’s concerned, we may as well be the corpse he is studying so closely. It’s very noticeable that in the odd moments here and there when Sherlock pretends to be ‘normal’ in order to get someone to do what he wants or to draw them out in some way, the effect is jarring and just a little bit scary. And our camera-narrator works hard to emphasise this distance between him and us in another way, almost an opposite way: Sherlock is put behind glass for us, as if the roles have been reversed and he is the specimen we are to study. There is a proliferation of scenes in which we see Sherlock through windows, reflected in mirrors or in his magnifying glass, in reversed images viewed in the rear view mirror from the point of view of yet another taxi driver…once you become aware of it, it’s astonishing how many times some kind of glass frame falls between the viewer and Sherlock, particularly in the episode entitled The Great Game. Other blockages and obstacles obscure the audience’s view: scenes featuring a single light source are wreathed in shadows and the characters seen in silhouette as a result; often an object in the foreground is blurry and the viewer is forced to focus instead on what lies behind the object; physical objects obscure the full picture and the viewer is left looking at a blind spot; characters shift in and out of focus so the viewer’s concentration is directed at the character who can be clearly seen. Even the scene changes are very often marked by something moving across the screen and temporarily obscuring what we can see. In this way, our view is closely directed and manipulated, as I said earlier, all of which is very fitting for the detective-story genre, when all is opaque until the detective can reveal what happened and why. And the why and the who and the how is finally revealed in the kind of analeptic narrative sequence much-beloved of the genre in which we see what we have seen before, but Sherlock’s voiced-over narrative directs us to view events in a different light. The shiftiness of the narrative doesn’t even end there: in the credits for The Great Game, James Moriarty is listed simply as ‘Jim’, recalling his brief stint as Jim from IT, but we know who he is by now so why not list him as Moriarty? And am I right in thinking that Mycroft Holmes is never listed at all? If so, this is a nice touch – a gesture towards verisimilitude – we’re not allowed to know who Mycroft really is because he occupies a position of some importance and it all has to be kept very, very secret. Nice. I like it. Trying to make us think that the fiction is a reality – good! It’s all gone a bit meta– now, and that’s the way I like my fiction. Yes, Series 1 and 2 are pitch-perfect. But what the hell happened in Series 3? The show went from Best Telly Ever to slap-in-the-face let-down. What had been a winning formula was overturned in favour of a dumbed-down version, with the intention of selling the show to a bigger audience, perhaps, but at the risk of alienating the existing body of fans. My DVD arrived complete with a flyer trying to sell me Sherlock-related merchandise, and three episodes later I felt the characters had been turned into marketable versions of their former selves. This was not the same show. These were not the same characters. I can’t fault the performances – the hugely talented cast are all working with the script that’s put in front of them, after all – but the writing was just awful: it was disrespectful to the characters, to the relationships that had been established between them, and worst of all, to the faithful audience. The end of Series 2 was incredibly powerful: an hour and a half of emotional intensity, which left me with the most appalling headache. The crying certainly didn’t help. No one is going to outdo me on grief here – the sight of poor smashed Sherlock on the pavement with blood all over his lovely face, and John Watson desperately trying to reach his friend – well, I had my knuckles in my mouth to stop me from screaming. By the time it got to John Watson’s graveside eulogy for his lost friend (‘please stop this, please don’t be dead’), I was blowing snot bubbles in between racking sobs. …And what do I get in the first episode of Series 3? Silly slapstick in restaurants. Sherlock pretending that he and John are about to be blown to smithereens and then laughing at the expression on John’s face. A show that had fallen in love with its own cleverness and was attempting to emulate the parodic self-referentiality that so many US shows do so well: much of the humour of Buffy, for example, lies in the show’s ability to poke fun at itself and parody various genres within its own framework. But that’s not going to work with Sherlock, I’m afraid. We don’t want jokey fun Sherlock. We liked the sociopath. We don’t want a Sherlock who seduces women (Janine) in order to gain access to their bosses – he’s not James Bond, he’s Sherlock. I loved the disregard for gender that featured so strongly in the first two series: John’s sister is gay, Irene Adler tells us she is gay but she still fancies Sherlock, Sherlock might be gay but is fascinated by Irene Adler, etc. – it’s all people being attracted to other people regardless of genitalia, and this set-up is infinitely preferable to the repulsive James Bond-type scenario. As you may have guessed by now, in spite of my horror at the travesty that is Series 3, I am utterly and irredeemably Sherlocked. But I won’t be buying the T-shirt. 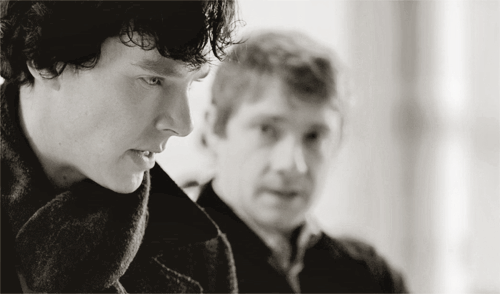 Please, Gatiss and Moffat, please bring back Sociopath Sherlock, the one we really loved. Otherwise he truly is dead. Since posting, a friend has made the following comment: ‘A pedantic note about “His Last Vow”: in the original short story, “Charles Augustus Milverton”, Holmes does become engaged to a maid in Milverton’s employment, for purely pragmatic reasons. The cad!’ Fair enough, I stand corrected, but I also stand by my point that Sherlock was getting a bit James-Bondy in the third series: examples of Bondiness include the sequence in which Mycroft ‘rescues’ Sherlock from his captors, and again a bit later on when Sherlock hijacks a motorbike to save John Watson from a grisly death. Tch. The aforementioned friend also complained about the length of my paragraphs…so I’ve put some more pictures in. Hope the post is more readable now. Thank-you for this wonderful article. I completely agree – they’ve lost sight of Sherlock. 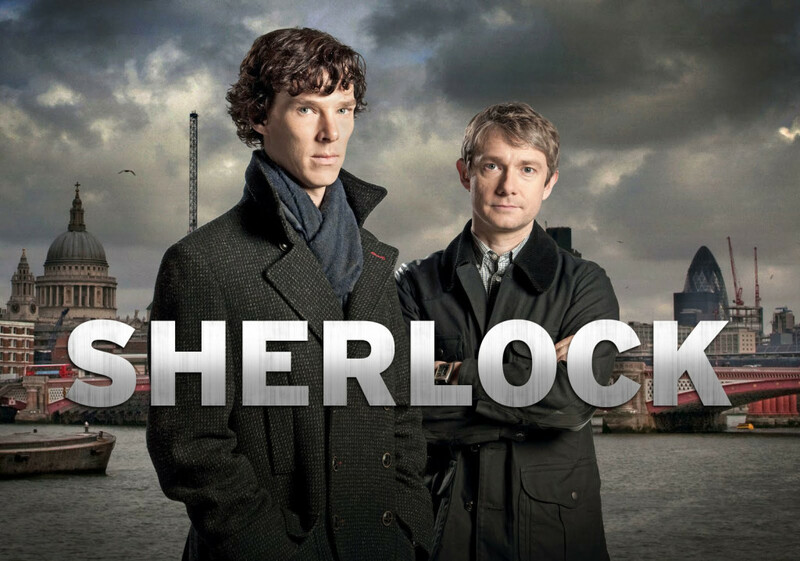 The actors are so wonderful that the series is still “unmissable”, but this third season character isn’t Sherlock and it just doesn’t satisfy as much, somehow. BTW, I thoroughly enjoy your “long paragraphs”. That’s very kind of you, Sharon, thank you, and I’m glad you enjoyed the post! I wonder what we can expect from Series 4. A return to form seems unlikely, unfortunately, because it’s difficult to imagine how the creators can turn it around…but we’ll always have the first two series to take pride of place in our DVD collections.